A recent sighting of three precious, pudgy gray babies in the forests of Indonesia has reinvigorated hopes for one of the world's rarest and most critically endangered species. 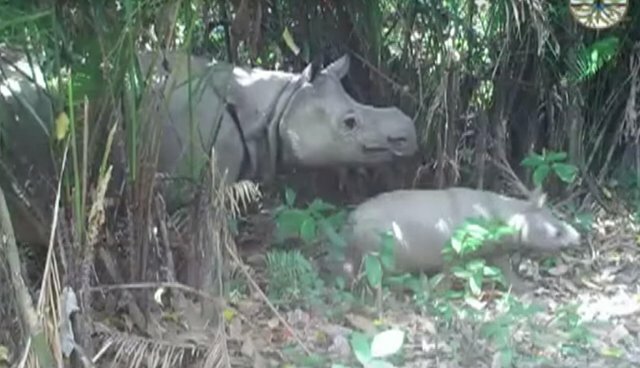 The three youngsters, a male and two female Javan rhinoceros, were each spotted by forest cameras earlier this year trotting with their mothers in Ujung Kulon National Park, home to the planet's last remaining population of these animals. Prior to their discovery, only 57 Javan rhinos were thought to be in existence there - making each of these new arrivals a significant addition to the species' numbers as a whole. Footage shows the calves looking happy, healthy and, of course, cute as can be. While it's easy to enjoy the rare footage for its aww-factor alone, for conservationists who dedicate their time to preserving the critically endangered species, these confirmed births are as heartening as they are heartwarming. "This is wonderful news, now we just need to ensure their protection," Widodo Ramono, head of conservation for the Indonesian Rhino Foundation, told AFP. He credits the recent creation of a sanctuary within Ujung Kulon park for helping to bolster the rhinos' numbers, but adds that many of the same old threats still persist. Javan rhinos were once plentiful in the region prior to experiencing a rapid decline from poaching and habitat loss - but thankfully, the birth of these three calves offers further proof that there's still time to save them from being lost forever. To learn how you can help Javan and other threatened rhino species, visit the International Rhino Foundation's website here.